It is that time of year again, when I have to go through the process of breaking in sandals. I really lament this process. 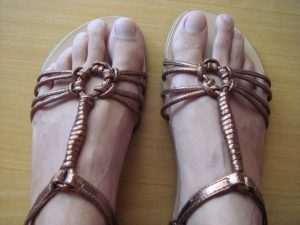 Whether it is breaking in new sandals or getting used to old ones you haven’t worn in nine months, for me the there is always a break-in period. It takes days of bad to get to the point where my sandals feel OK. There’s the phase where the rubbing of the material on certain toes requires a nearly artistic focus on band-aid placement. There’s the phase where you have to constantly check your nail polish to ensure that there are no chips. There’s the phase where you increase the amount of time you wear them while your legs adjust to walking in such flat shoes. And of course there’s the phase where you try to make your favourite ones work with every outfit you own. Personally, I like socks a lot. Even in very hot weather, my feet are often cold, and I prefer my feet more covered than not. There’s something about having my feet out there, bearing their soles, that feels weird to me. For the record, the feet in the caption photo above are not mine. I have strange feet. This means I’m not really a natural sandals person to begin with. There are a lot of seasonal things in HR that I feel the same way about, and as we go into the summer season, I am reminded of the need for blister prevention at work. Performance reviews, compensation budgeting, insurance renewals, staff planning, audits–we’ve got to be on top of the anticipated questions, the objections and the outcomes. We have to excited about whatever we are rolling out is. Whether it is rolling out something entirely new or dusting off something familiar, there is still a lot of contemplation involved in making them fit. What are your HR sandals?